It’s never too late to change bad habits, reverse some damage, and prevent future complications. However, the older men get, the less likely they are to focus on their health. The following tips can help your aging loved one maintain his current health and prevent future issues from occurring. 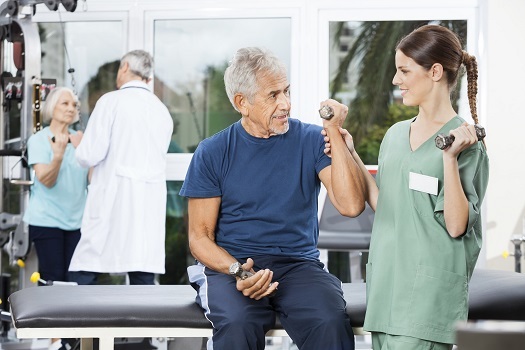 Senior men are less likely to go to the doctor compared to women. Most elderly men only go if they think something is seriously wrong, and sometimes even that isn’t enough to convince them to make an appointment. Encourage your loved one to start with a yearly physical, even if he feels okay. The more quickly a health issue is diagnosed and treated, the more likely your loved one will thrive throughout the rest of his life. Seniors can face a variety of challenges as they age, many of which can be mitigated with the help of professional in-home caregivers who provide high-quality home care. Toronto families trust in Home Care Assistance to help their elderly loved ones age in place safely and comfortably. Smoking can cause multiple types of cancer, increase the chances of developing heart disease and high blood pressure, and complicate existing conditions like diabetes. Studies suggest quitting smoking can change the body in as little as 24 hours after the last cigarette. If your loved one smokes, it may be time to talk to him about ways to quit. Life can be stressful for older adults, but the way they handle it is what’s important. When faced with stressful situations, many seniors resort to smoking, drinking, and emotional eating. Healthy stress management techniques include exercise, meditation, or taking up a hobby or sport. If your loved one is living with excessive stress, help him find ways to eliminate it. Failing to manage stress can lead to high blood pressure, a suppressed immune system, anxiety, and depression. Regular socialization can also help older adults let go of negative emotions and reduce their stress levels. For families living in Toronto, respite care can be a wonderful solution when their aging loved ones need companionship and socialization a few hours a week or just need minor assistance with daily household tasks. At Home Care Assistance, we thrive on helping seniors maintain their independence while living in the comfort of home. To reduce their risk of automobile accidents, aging men should follow the speed limit, drive cautiously, and avoid driving after consuming alcohol. As your loved one ages, regular vision and hearing checks can also keep him safe on the road. If driving becomes a major safety hazard, talk to your loved one about alternate forms of transportation such as public buses or ride-hailing services. Excessive weight gain increases the risk for heart disease, diabetes, and some forms of cancer. Being overweight can also be hard on body parts such as the knees and back. If your loved one is overweight, consider creating a weight loss plan. Eating healthy foods like lean proteins and vegetables is a good place to start, and getting more exercise is beneficial as well. If your loved one is having difficulty losing weight or finding the motivation, consider asking his doctor for help. Maintaining a high quality of life can be challenging for some seniors, but professional caregivers can help them obtain this goal. Families can trust Toronto elderly care experts to help their elderly loved ones focus on lifestyle choices that increase the chances of living a longer and healthier life. To create a comprehensive in-home care plan for your aging parent, call Home Care Assistance at (416) 488-8777 today.